The earth's rising temperature together with concerns to meet the ever burgeoning energy needs of humanity has left power generation companies at cross roads. Evaluation of projects is an uphill task in this scenario. The traditional DCF evaluation method breaks down in the face of significant uncertainty that power generation technologies bring in. Hence, finance managers should turn to real options to appreciate and value the choices inherent in the current scenario and take strategic decisions aimed at creating long term stakeholder value. On 14th June, 1992, a treaty was signed at the Earth Summit held in Rio de Janeiro. The treaty (UNFCCC), popularly known as the Kyoto Protocol aims at stabilizing greenhouse gas concentrations in the atmosphere. It established legally binding commitments for reduction of major greenhouse gases and included additional means for member countries to meet their emission targets with market based mechanisms. This event resulted in a paradigm shift in the way power companies operated and in their future investment strategies. Typically a power company needs to make the strategic decisions on fuel and technology. Though a lot of attention has been paid to alternative fuels, the fact remains that none can match coal. Presently coal is the largest source of fuel used for generation of power and is preferred over other sources since it is plentifully available and is distributed widely across the world. However, the biggest disadvantage of coal is that it is a dirty source of energy, bringing with itself a lot of impurities that lead to huge pollutants being emitted in the atmosphere. In its simplest form, coal is pulverized (reduced to fine particles) and burnt in a furnace, the heat from which is used to generate steam which in turn spins a turbine and ultimately powers a generator. Considering the advantages of coal, a lot of technical upgrading has been done in the past to make a coal-based power plant more efficient. However, these developments primarily covered the technical aspects of power generation , thereby focussing on increasing heat and generation efficiency. Integrated Gasification Combined Cycle (IGCC) is the latest technology (after supercritical and ultra-supercritical pulverized coal technology) which has the flexibility to co-fire multiple fuels and use a variety of low grade coal for electricity generation. Though the evolution of technologies has been rampant, newer concepts that focus on emission control have emerged after the Kyoto Protocol and thus today's primary area of concern is capture and storage of carbon. Carbon capture and storage (CCS) is an approach towards mitigating global warming based on capturing CO2 from large sources like fossil fuel based power plants and storing the captured CO2 instead of releasing it to the atmosphere. CO2 thus saved can be traded as CER (Certified Emissions Reduction) rights across various "energy exchanges" generating supplementary cash flows for the power plant. Power generating firms have the option of either constructing plants with built-in CCS capabilities (also called capture ready plants) or building ordinary plants initially and then retrofitting them for CCS at a later date. Should the plant be built capture-ready or retrofitted later? Is there an optimal time to retrofit? Valuing costs under the last option will capture the value of strategic opportunity to defer CCS investments until costs and CER prices make it economically justifiable. 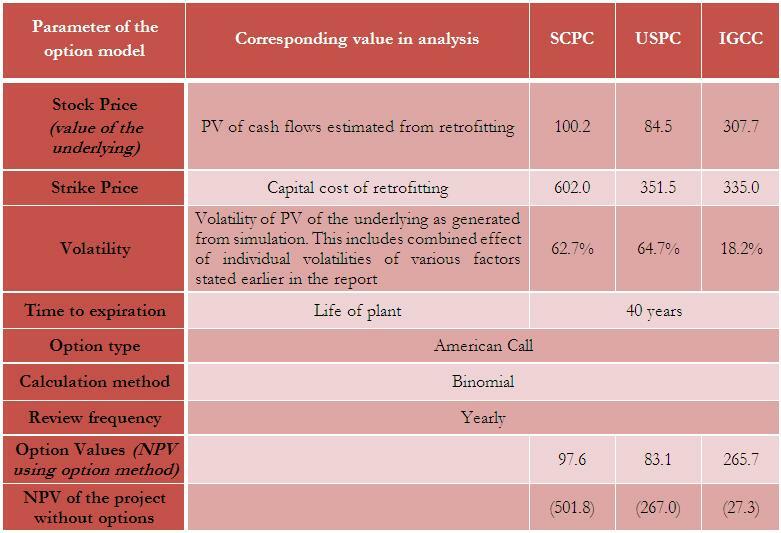 We evaluate the value of option to build a base case plant initially and then retrofit later depending upon whether the present value of incremental cash flows from retrofitting exceeds expenditure incurred. Most of the variables affecting the option modelled in Exhibit 4 have been assumed to follow triangular distributions. 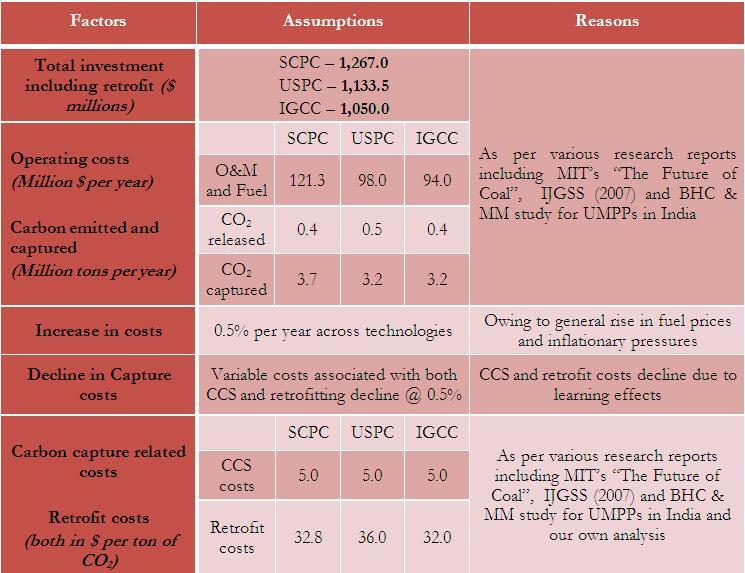 IGCC is least costly when option value to defer retrofit investment is considered. 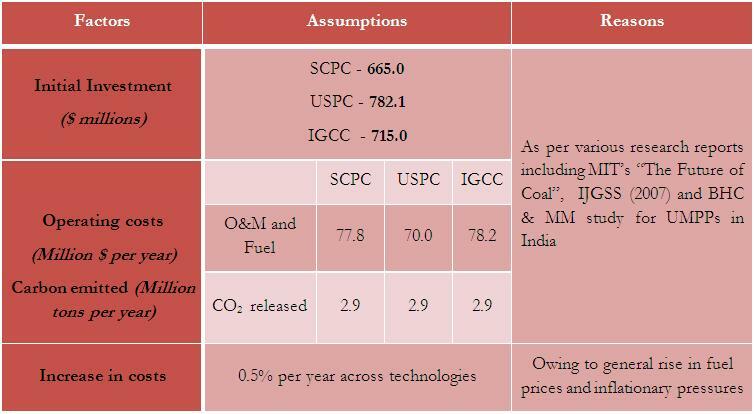 Though base case IGCC plant (without capture) is more costly and less efficient than USPC, it is more suited to CCS and hence becomes economical in a capture-ready scenario. To summarize, IGCC is much better in a CCS acknowledged scenario and the technology is expected to be adopted at a much larger scale in the near future. Next, we attempt to identify the optimal retrofit year while taking into account the problem of early exercise and the cost of delay. According to option theory the option should be exercised when the value of the option is less than the pay off from immediate exercise. The need for simplifying options methods in a way which is sensible to corporate managers often leads to another problem which we faced in this study. Due to the nature of modelling, most of the real options indicate delaying the exercise until maturity. This is obviously confusing because even when the project has positive NPV as per DCF, real options indicates managers to wait assuming there will be better scenarios. However, by modelling the cost of delay, it is possible to arrive at an optimal year of exercise based on real options model. Hence without compromising on the benefits of real options it is possible to arrive at decisions which are accurate as well as intuitively appealing. We have taken the example of IGCC to prove our model (similar exercise can be done with other projects). Every year a manager should compare the value of option and NPV and exercise the option of retrofitting the plant if the latter is greater. 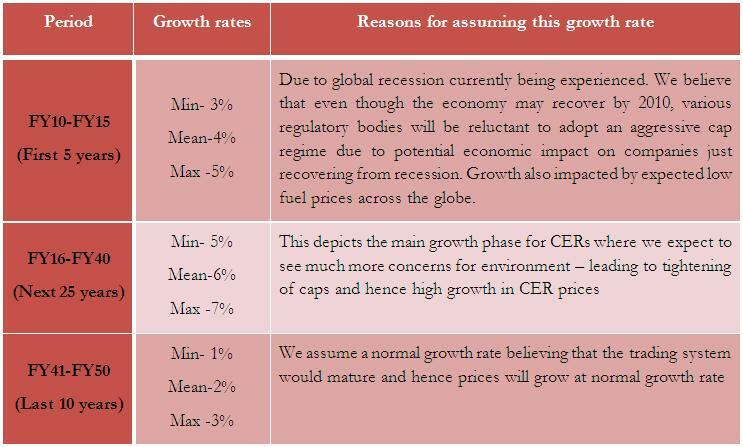 To simulate this we have assumed (shown in Exhibit 6) a particular trajectory of CER prices. The cash flows in Column 1 represent cash flows according to those prices. Column 2 shows the PV of cash flows as at that year and Column 3 shows the underlying yield rate calculated as per above formula. 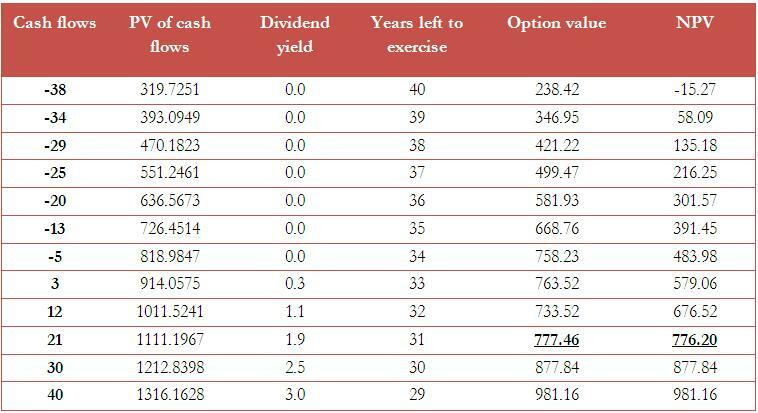 Based on the above results we find that the value of option is greater than NPV till year 9. In the 10th it merges with NPV value and subsequently remains equal. This is because we have used American options whose value is always higher of value calculated as per option pricing formula or payoff from exercise whichever is higher. Based on the above result we can say that the manager should retrofit the IGCC plant in the 10th year (under the scenario assumed). Through this article, we have emphasized the importance of carbon capture and storage (CCS) in this world of ever rising global warming. In order to implement this, power plants have the option of building their plants with these systems or retrofitting them at a later stage. The models described give a finance manager's perspective of these decisions. In the process of analysing these models, we have brought out the decisions in a quantitative manner. The major conclusions are that Integrated Gasification Combined Cycle (IGCC) is much better in a CCS acknowledged scenario and the technology is expected to be adopted at a much larger scale in the near future, and that the optimal retrofit year for the IGCC plant is the 10th year.